Hello stamping friend! It’s Thursday today, and that means it’s time for a new round of Special Offers from Stampin’ Up! These are some amazing deals! They will be available from today, Sept. 8th through next Wednesday, Sept. 14th. These items can be used for just about any project you’re working on – for birthdays, Christmas, or just any occasion! To place your order directly online, you can click on the pictures above, to go directly to my online store. Just use Hostess Code NZ7MQJR7. I will be out of the country from Sept. 11th – Sept. 26th (I will have some post pre-written and scheduled to post while I’m away), so I won’t be here to place any orders on your behalf. 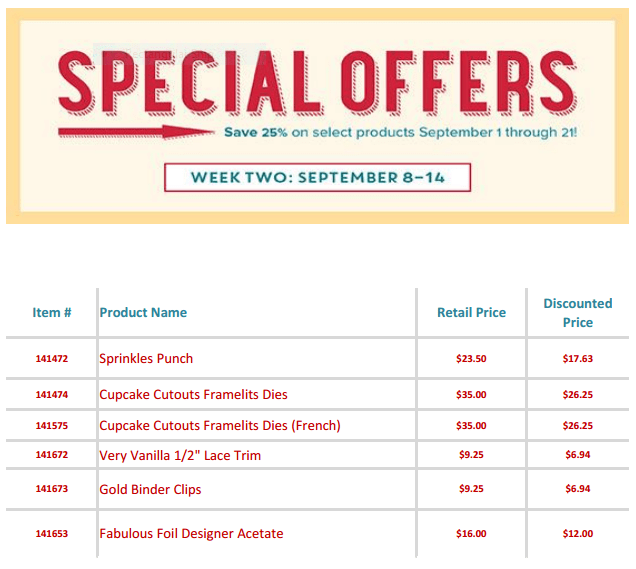 Please use my online store, and the Hostess code above for the month of September. Everyone who uses the hostess code will receive a free gift from me, as my thank you for ordering during my absence! Be sure to check back again next Thursday, for new deals! Next Next post: Leavin’ on a Jet Plane!